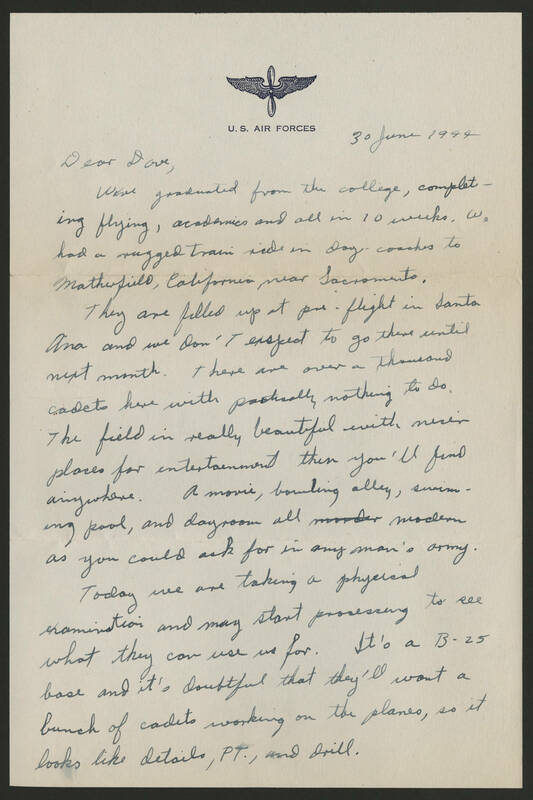 30 June 1944 Dear Dave, We've graduated from the college, completing flying, academics and all in 10 weeks. We had a rugged train ride in day - coaches to Matherfield, California, near Sacramento. They are filled up at the pre-flight in Santa Ana and we don't exspect to go there until next month. There are over a thousand cadets here with [illegible] nothing to do. The field in really beautiful with nicer places for entertainment then you'll find anywhere. A movie, bowling alley, swimming pool, and dayroom all modern as you could ask for in any man's army. Today we are taking a physical examination and may start processing to see what they can use us for. It's a B- 25 base and it's doubtful that they'll want a bunch of cadets working on the planes, so it looks like details, PT., and drill.